Moroccan influences abound in this exciting kilim area rug produced in mesmerizing colorways. Part of the Baja Collection, it has a handcrafted look and the natural comfort of cotton. A fiery orange and red color theme captures the brilliance of a desert sunset. Design elements include medallions, end borders and self-fringe. An added bonus: it is reversible. A Runner is a Runaway Success! 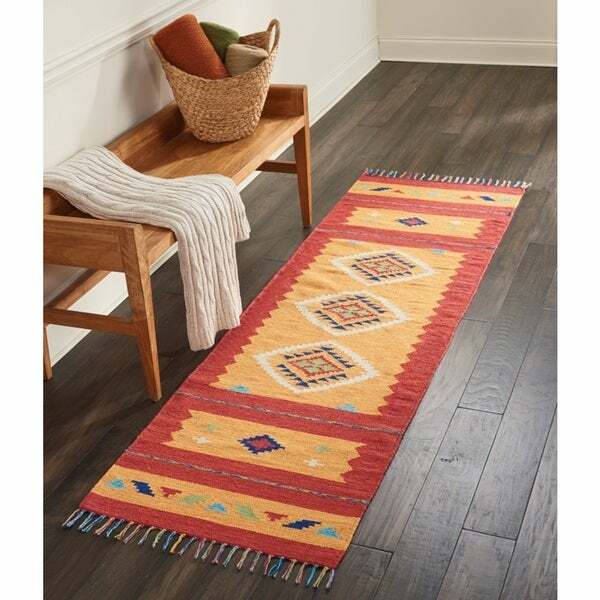 Love the bright colors of this rug and it fits perfectly with our southwestern decor. It's used in the kitchen to give color to the dark floors and neutral countertops and appliances. It used to move quite a bit with the traffic over top, but I added a rug pad underneath and that instantly solved the problem. There is a tag sewn onto one side, but by removing it, the rug becomes reversible. It has suffered some stains when I wasn't able to wipe up spills fast enough, but it's not enough to pull up the rug. This was a great choice! Love these colors. I use it in my bathroom and it has held up now for over 6 months. Got this for my entry way looks great love it!! Nourison Baja Moroccan Orange/Red Area Rug (3'6 X5'6) - 3'6" x 5'6"